Beautiful. I've never been to these towns in Southern California, but I feel like now I know them a bit. 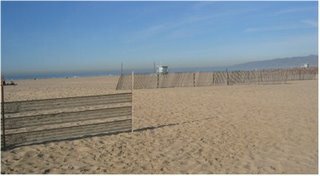 In my mind I can compare them with the parts of the beach I know...Seal Beach and La Jolla, San Diego and Long Beach...and this makes me want to visit them. To get to know them, their sounds and feel. 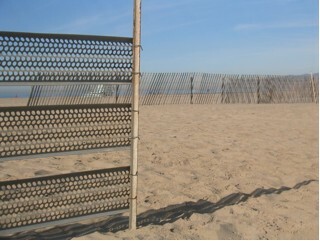 To visit the place where the two fences meet. To see if I can understand their conversation as you do. Thanks for the mini vacation on this cold full-moon night. lovely. what wonderful pictures and the story you tell from that angle is so lovely. and i can't help but shiver from the thought of what global warming is doing, and what use your fences will have if it contines to stay warm. "The sky poses dramatically for photos..."
My favorite line in this richly descriptive, imaginative piece on winter. this post gave me chills deezee. when i lived in los angeles oh so long ago, the beach in the wintery months was my most favorite time of all. how i long to take a walk with you and your dog on the sand bundled up and enjoying the gray quiet of venice when the crowds have gone. 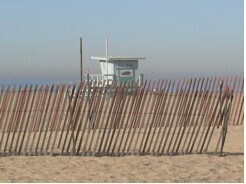 this post totally brought me back and now like many other northeasters, i'm wishing i too lived in southern cali, sigh. and i just want to add how freaked out i am by global warming. last friday night it was 68 freaking degrees here and most of november has felt like winter in los angeles. a few friends even commented, jokingly (except it's so not funny) that this weather must remind me of home. and what the hell is wrong with these same friends (the term is very loosely applied here) that when i mention it's not great, that global warming is really on top of us, they slightly laugh and say they'll take it. feh. Very nice photos and I loved the narrative. Thanks for sharing. great post. :) Winter arrived at my house today....finally. 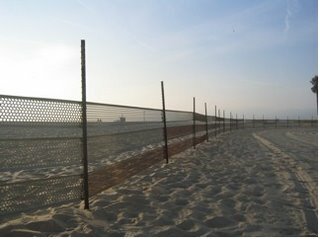 I never knew they put fences up at the beach. I like the pictures and they sense of subtle transition to a new season.